If you thought last year's "Share a Coke" campaign was clever -- putting personal names on 20-ounce bottles of Coca-Cola (KO) products -- you're probably not surprised to learn that the soft drink giant has bigger plans in store the second time around that will bring more names and drink containers into the fold. "Share a Coke" will be back this summer, and AdAge is reporting that Coca-Cola plans to take things to a higher level. Last summer's campaign found Coca-Cola targeting teens and millennials by placing 250 different first names on Coke bottles, promoting share-themed hashtags to make the "Share a Coke" campaign go viral. Instead of personal names, the advice on the cans was to share the beverage with colloquial friend terms like Buddy, BFF or Superstar. It worked. U.S. sales of carbonated beverages rose 2 percent during last summer's promotion relative to the same period a year earlier. A 2 percent uptick may not seem like much, but it actually reversed a decade of declines at Coca-Cola. We're not drinking as many soft drinks as we used to. We've eased back on sugary soft drinks -- whether we're talking about soda sweetened by actual cane sugar or high fructose corn syrup -- fearing the health risks. It gets worse. Diet sodas that should have taken the baton have been falling even harder in recent years on concerns about the artificial sweeteners. It's not just the potential long-term health issues that have kept consumption in check. SodaStream (SODA) marketed its machine as a maker of non-diet soda that packed just a third of the calories, carbs, sugar and sodium used in Coke or Pepsi. That didn't resonate with the public, and its stateside sales have been falling sharply for more than a year. It's a bleak snapshot. It explains why Coca-Cola and PepsiCo (PEP) have spent the past few years either acquiring or introducing new non-carbonated beverage product lines. It also helps draw attention to the first marketing stunt at Coca-Cola in years that has actually worked. There will be some changes when the new personalized bottles and cans roll out in June. For starters, that database of 250 names will at least triple this time around, according to AdAge. If your name was too obscure for the first round, hope may spring eternal this time around. 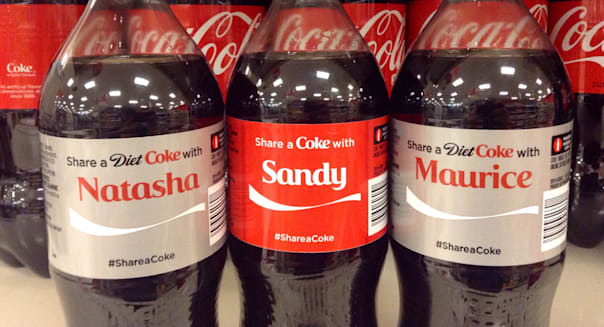 Coca-Cola also expects to expand the personalized sharing messages beyond the 20-ounce bottles. It remains to be seen if that means that the gimmick will spread to the 2-liter bottles or into the two different can sizes. It should work with folks trying that much harder to seek out their names. There was a bit of a cottage industry last year as collectors sold off some of the more unique monikers, and that should repeat with the broader Rolodex this time around. The ramifications will be huge if sales go the other way. It will suggest that the public has tired of the one marketing campaign that has actually worked at Coca-Cola over the past decade. The carbonated beverage industry has a big problem, but for at least one more summer it won't be afraid to take names. Motley Fool contributor Rick Munarriz owns shares of SodaStream. The Motley Fool recommends Coca-Cola, PepsiCo, and SodaStream. The Motley Fool owns shares of PepsiCo and SodaStream and has the following options: long January 2016 $37 calls on Coca-Cola and short January 2016 $37 puts on Coca-Cola. Try any of our Foolish newsletter services free for 30 days. Check out our free report on one great stock to buy for 2015 and beyond.